Experience the thrill of trekking to Base Camp of the highest mountain in the world. Mount Everest stands at a majestic 8,848m above sea level, towering over the rest of the Himalayas. This is a challenging trek but one that will reward you with breathtaking scenery and unforgettable views across one of the world’s most impressive mountain ranges. We take a steady pace as we climb the trail, allowing plenty of time to acclimatise, and allowing you the opportunity to fully appreciate your incredible surroundings. All of our treks are led by a local Sherpa who has summited Mount Everest. This is a fully supported journey, staying in teahouses throughout the trek. There are a number of options available, which also include camping and luxury lodges. Please contact us to talk through your preferred accommodation. During the trek you will be accompanied by a Sherpa guide who has climbed Mount Everest. This will give you a special insight in to Sherpa life and what it’s like to stand on Top of the World. 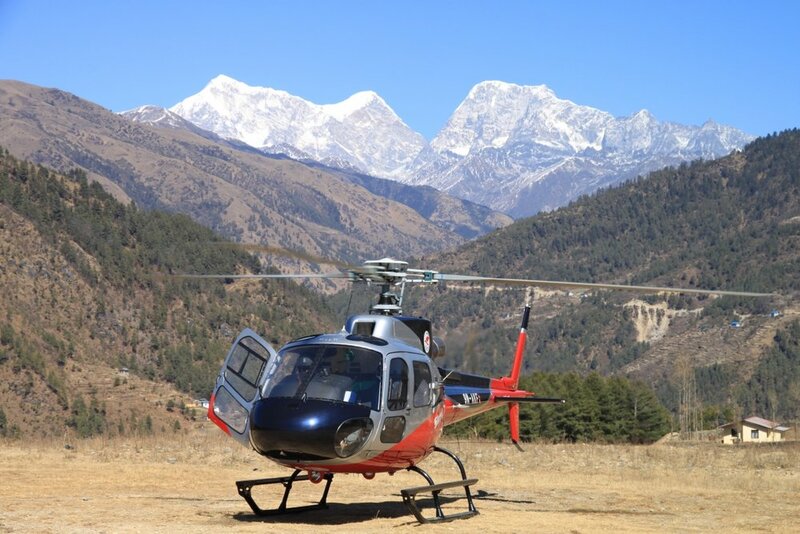 We can also provide private helicopter flights from Kathmandu to Lukla, as well as scenic flights to Mount Everest. Please contact us for more details. Welcome to Kathmandu! Transfer and check into your hotel, located in the heart of Kathmandu where you are met by an amazing blend of cultures, religion and people. In the evening there will be a full briefing to prepare for the trek. A chance to enjoy your new surroundings before the trek begins. Today is a great opportunity for sightseeing and exploring the beautiful, chaotic, bustling city of Kathmandu. Evening kit checks and briefings. After breakfast we take a short flight to Lukla, from where we begin our trek into the Khumbu region. The views from the plane are breathtaking, providing dramatic scenery of terraced hills as well as the mountains, including Gauri Shankar, Melungtse and Numbur. After landing we meet our crew and head northwards on a 3-4 hour trek to Phakding where we will be spending the night. We continue trekking along the banks of the Dudh Kosi, passing a checkpoint before crossing this roaring river on exciting suspension bridges laden with prayer flags. After entering Sagamartha National Park, the trail climbs steeply, offering us our first breathtaking views on foot of Everest and Lhotse as we reach Namche Bazaar, the gateway to the Khumbu region. here. Namche is the Sherpa capital, a bustling village crammed with markets and traditional Sherpa houses. The small town is also famous for its outstanding scenery and as a junction for trekkers as the majority of Sherpa and mountaineers pass this way on route to Mount Everest. We will take an early morning hike to the Everest View Hotel, from where we can see views of Everest, Lhotse and one of the most beautiful mountains in the world, Ama Dablam. The rest of the day is free to explore Namche and it’s many lovely cake shops! From Namche Bazaar, we trek along the contour of the hills across a series of ascents and descents, with amazing views both into the deep and lush valleys below and of the towering mountains in the distance. We follow a quieter route here than many other trekkers, through forest areas where it is possible to encounter musk deer and colourful peacocks. We reach Phortse, a small village on the edge of the Khumbu Valley where we can see Cho Oyo, Taboche, Cholatse and Ama Dablam. The trek continues ascending further as we trek through meadows and pine forests. We cross another exciting suspension bridge on the Imja Khola, and pass through Pangboche, the home of a beautiful ancient monastery. From Pangboche, the route winds high above the valley floor, passing through various Sherpa settlements and also the Gompa, which houses the famous Yeti scalp. We will spend tonight and tomorrow in Dingboche. Today will be a valuable day to acclimatise and allow our bodies to adjust to the altitude now that we have ascended above 4,000m. There is the option to spend the day relaxing or to explore the area. There is the opportunity of a light hike into the Imja Khola Valley where you can see some fantastic views, from the mountainous scenery of Makalu, Borangche, Ama Dabam and Island Peak, to the Khumbu Valley stretching out below us. From Dingboche we head towards the Khumbu Glacier. The trail leads us through farmlands and meadows. We will stop in Dzugla (4570m) for lunch before continuing along the lateral moraine of the Khumbu Glacier. Today we also pass by the stone memorials to climbers who have died on the mountains around us. Many trekkers appreciate stopping here to pay their respects, to read the moving tributes and find memorials to famous mountaineers. We follow the trail to Lobuche, admiring the views of Nuptse, Kala Patthar and Pomo Ri. An early morning start sees us beginning a challenging day as we make our way to Everest Base Camp itself. Today’s trek starts off fairly relaxed as we continue along the side of the Khumbu Glacier. We stop to rest and refuel at Gorak Shep before we finally reach our goal of Everest Base Camp. You will have ample time to fully appreciate the area, as well as the breathtaking views surrounding us, before returning to Gorak Shep for the night. 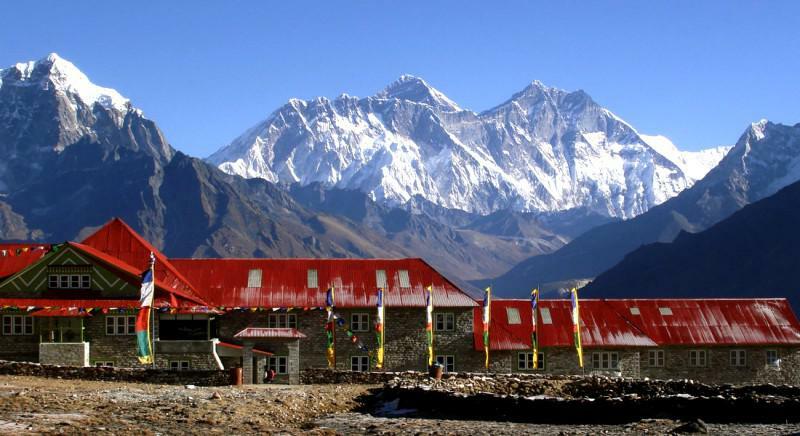 Gorak Shep is situated at the foot of Kala Patthar and was the original Base Camp used by Sir Edmund Hillary and Tenzing Norgay on their successful ascent of Everest, before the Base Camp moved closer to the mountain on the edge of the Khumbu Icefall. Another early start today is well rewarded with unbeatable views as we ascend to the summit of the non-technical Kala Patthar. We aim to reach the summit as dawn breaks and the many incredible mountains before us reveal themselves. From this viewpoint there is an amazing panorama, which we will take plenty of time to savour as the sun rises, before retracing our steps back down to Gorak Shep and then continuing on to Pheriche. Today we follow the route back to Pangboche then onto Tyangboche where we can visit the legendary monastery, the largest in Khumbu. This is also a good viewpoint to see Everest, Lhotse, Ama Dablam and Thamserku from a different angle. We spend the night at the foot of the sacred mountain, Khumbi Yul Lha, in the valley of Khumjung. We descend further, passing through the more vibrant atmosphere of Namche, which seems even livelier than before after the time we have spent in the quiet of the mountains. Continuing on along the banks of Dudh Koshi, we end the day in Phakding where we rest overnight. On our last day on the trail, we hike from Phakding to Lukla. We stay overnight in Lukla, celebrating our achievements and enjoying the warm Sherpa hospitality. The scenic morning flight back to Kathmandu gives us one last chance to say farewell to the mountains. Spend the day resting and relaxing or see some of the sights in Kathmandu. It’s the perfect opportunity to get some souvenirs, or simply relax poolside. Celebratory dinner and drinks. The best times to trek to Everest Base Camp are the Spring and Autumn. Late March to late May, and late September to late October often have the most reliable weather. It is possible to trek year round, although we recommend either the main season or it’s close shoulder period for the best experience. The trek itself is suitable for fit walkers. A typical day involves 4-6hrs of trekking over undulating, often rocky terrain and dirt trails. All equipment is carried by porters, but you should be able to carry your day pack of around 7kg for up to 8hrs of walking.